Rugged, machined aluminum components enhance shooter's grip and aid in fast, positive magazine changes for an edge in competition or combat. 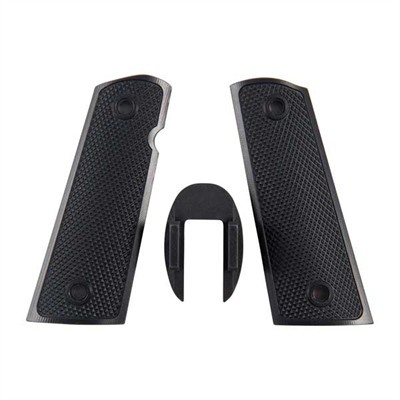 IDPA- and USPSA-legal extended magwell helps guide the magazine for fumble-free changes when seconds count, and requires no permanent alterations to pistol frame. Full-length grips provide secure retention of the magwell, yet allow return of pistol to stock configuration simply by reinstalling the original grips. Grips have precision-cut 16 lpi full-surface checkering to help you maintain a firm hold even in the heat of competition. Excess metal is machined away from the panel interior to reduce weight without sacrificing strength. Cut for ambi Mfg: Techwear Usa SPECS: Machined aluminum, anodized, black or silver. Grips - 1.8 oz. (52g). SP magwell - .7 oz (20g) weight. Carry magwell - .4 oz (11g) weight. XT magwell 1.2 oz (34g) weight. TGO magwell .6 oz (18g) weight. Fits full-size Government Model and Commander pistols.